A psychologist and Senior Lecturer has been awarded the Scottish Cancer Foundation Prize and Evans Forrest medal for her research into the early diagnosis of cancer. 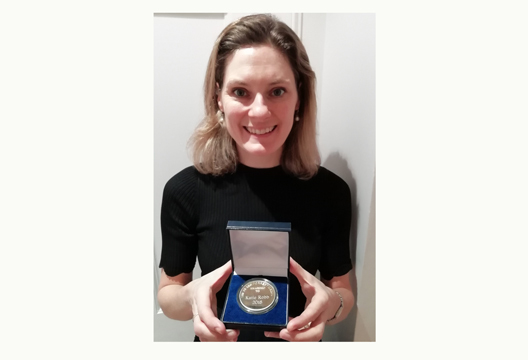 Dr Katie Robb (University of Glasgow), who has spent her career using psychological knowledge to develop interventions to improve cancer screening attendance and awareness, was the first ever psychologist to win the foundation prize and medal. Since her PhD with the late Professor Jane Wardle, who pioneered research on cancer prevention, screening, and early diagnosis, Robb has devoted all of her research to the field. Thanks to a Cancer Research UK fellowship Robb was able to explore ways to improve public uptake of home-based bowel cancer screening which involves taking a stool sample and sending it for analysis. Robb’s results showed that potential screening participants found the stories reassuring and the approach also increased their intention to take part in bowel screening in the future. Recently Scotland’s bowel cancer screening programme has adopted this approach after Robb informed them of her findings. During this time Robb was also heavily involved with developing the Cancer Awareness Measure, intended to provide a standardised method of assessing cancer awareness. The measure has been adopted in the UK and in many countries across the globe and allows for the assessment of changes in the awareness of cancer across time, between and within countries. Although there are ample opportunities for the role of psychologists in improving cancer awareness and early diagnosis the area remains under-researched. Robb, who now has a post-doc and three PhD students, also hopes to train a cohort of people in this area over the coming years.